WE’VE become used to seeing familiar names at the forefront of world football. 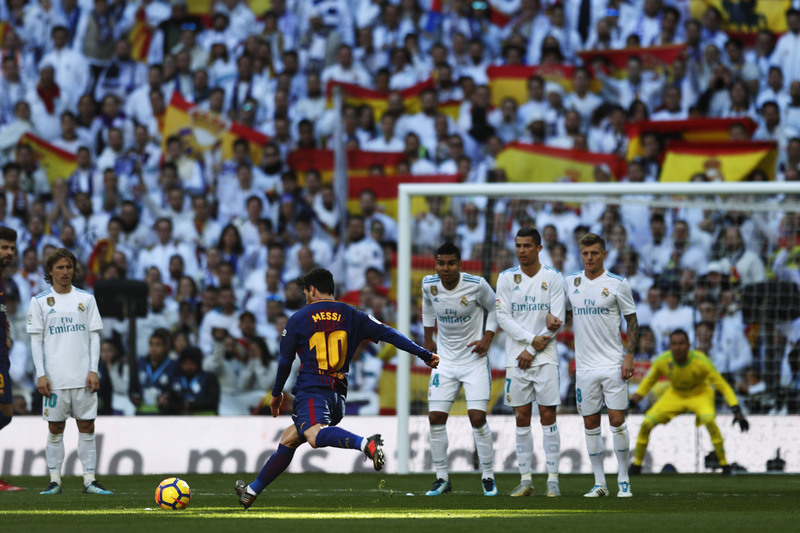 Lionel Messi and Cristiano Ronaldo have dominated polls and awards since 2007 and the recent Guardian ranking of the top 100 players – arguably the best list of its kind – places Messi top and Ronaldo second. Recently, Ronaldo was named the winner of the Ballon d’Or for the fifth time. These two players have competed with each other for the major individual prices for the best part of a decade, which makes you wonder when will they be knocked off their pedestal and who will do it? Messi is 30 and Ronaldo 32, they should be coming under pressure at this stage of their careers but there is a distinct lack of contenders. This says a lot about the brilliance of these two players, but it also raises questions about the type of footballer that is coming through the ranks. Messi and Ronaldo are both exquisitely-gifted. As well as being products of their age, they are also naturally talented and their skills were honed at an early age against a humble background. They may well be the last representatives of the boys from the back doubles, the urchin-like street footballers – the sort of player that countries like Brazil and Argentina used to produce with conveyor-belt regularity. Messi and Ronaldo have not had their skill and guile knocked out of them by coaching, systems and statistics. Many of today’s players are fit, athletic, powerful and fast, but very few are genuinely exciting to watch. Messi and Ronaldo make things happen through their strength, intrinsic skill and ability to improvise. Whoever assumes the mantle of the world’s greatest in the next few years, it is unlikely that we shall see another Messi or Ronaldo bout for some time. Their battle for supremacy has been the equivalent of other great sporting rivalries, comparable to Ali-Frazier, Coe-Ovett (!) and Borg-McEnroe. Two sublime talents in one pool. It is hard to see where the next tussle will come from. The top 100 reflects a shortage of young talent that can step-up. Of the ton, a third are 30 or over and there’s only two – Kylian Mbappe and Christian Pulisic – who are under 20. Neymar is the obvious heir apparent, but he’s 25 now and another luminary, Kevin De Bruyne (who will need to sustain his current level of performance), is 26. World-class and memorable talent rises to the surface at a very young age, it is not generally a development thing – for example, Pele, Maradona, Cruyff and Beckenbauer, to name but a few, were recognised as crème de la crème at a very tender age. Messi and Ronaldo have been at the very top for a long time. This means players like De Bruyne, Eden Hazard, Toni Kroos and Harry Kane may hit the top in the future, but it will be because there is no natural successor to La Liga’s golden duo. One of them could become the world’s best by default. The only obvious exception in the current batch could be Mbappe, who is just 19 and placed at number eight in the Guardian list. There’s a lot riding on this lad, but his swift elevation is recognition of a raw and exciting player who could become the next big thing. The Guardian rankings also demonstrate that the Premier is growing in strength once more, with 33 of the 100 players currently employed by English clubs. Another 29 come from La Liga, while Italy (14), Germany (13) and France (11) come next. In fact, the entire list is compiled from the so-called “big five” which further evidences the polarisation of world football. But the Premier’s 33 players (Manchester City have eight in the list, Chelsea seven and Tottenham five) also show how multi-national the Premier League is – as if we needed reminding. Only five English players are in the list – Kane (5th), Alli (31st), Sterling (62nd), Rashford (75th) and Vardy (96th), although this is higher than in 2015 and 2016. As a percentage of the number of players drawn from English clubs, however, this is a poor return, just 15%, especially when compared to Spain, which has 39% of its representation playing in La Liga. The best players in each of the “big five” leagues are all actually non-nationals – Messi (Argentina) is La Liga’s top player; Neymar (Brazil) is number one in Ligue 1; De Bruyne (Belgium) is top in the Premier; Lewandowski (Poland) is first in the Bundesliga and Dybala (Argentina) tops the list for Serie A. But what of the home-grown players? The highest-placed national at home is Harry Kane, who at 24 could well rule the roost for some time. Mbappe (19 – Paris St. Germain) is France’s top home-grown player. The top Italian in the survey is Gigi Buffon, a 39 year-old goalkeeper. This should send some worrying signals to Italian football, for the next Italy-domiciled Italian is Napoli’s Insigne who is 26. After him comes two stalwart defenders, Milan’s Bonucci (30) and Juventus’ Chiellini (33). Spain’s top player, according to the list, is Sergio Ramos (31), although Isco (25) and De Gea (27) are rising in the ranks. Germany’s top player is Tony Kroos of Real Madrid, but the leading national playing in his own country is 31 year-old goalkeeper Manuel Neuer (ranked 40TH). There are younger players not far behind, though, in the form of RB Leipzig’s Werner and Bayern Munich’s Kimmich. Spain, with 17, has more players in the list than any other nation, while France has a dozen and Brazil 10. Club-wise, Real Madrid has 13 in the top 100 and Barca 10. The entire list is spread across just 21 clubs, all European, with the Premier providing seven of them and Italy six. Does the list provide us with any pointers to the next World Cup? If you assume that having lots of world-class players gives you the springboard for success (location, luck, age and management also play a part), then you should be looking at the nation with the most mileage left in their top-class talent. Spain, for example, have six of their 17 players in the list over 30. At the same time, six are 25 or under. France, with 12 players in the 100, have a promising outlook, with only two players over 30 and one of them a goalkeeper. Argentina, the land of Messi, has some top names, but the 2018 World Cup could be the last chance that players like the Barcelona talisman, Juve’s Higuain and PSG’s Di Maria have of shining on the global stage. As for England, with the exception of Vardy, they have some young players who will continue to flourish in the coming years. They have yet to prove it in major games, but there are some green shoots of cautious optimism. Interestingly, the top 100 also shows which nations have problems – the Netherlands, for example, has one representative and that’s 33 year-old Arjen Robben. Russia, 2018 hosts, have no one. As it stands, Messi and Ronaldo stand tall as the men to knock off the pedestal. There are signs, that the latter may be in decline, but he’s an incredible athlete and still has gas in the tank. Until somebody comes along that has the staying power and that extra special quality, it is difficult to see either of them out of the picture. There’s a lot of stakeholders who will want their dominance to continue: Real Madrid, Barcelona, Argentina, Portugal, La Liga, two wealthy agents and a couple of sub-industries that operate around them. I feel as though, their presence could be a hindrance to the coming generation of footballers. It’s almost similar to comparing past legends like Di Stephano, Pele, Maradona and Bobby Charlton to the current crop of footballers leaving only one outright winner. Check out the blog i posted on the same.